Artists Making an Exhibition of Themselves! Saturday 1st October 2011, from 6pm to 9pm. 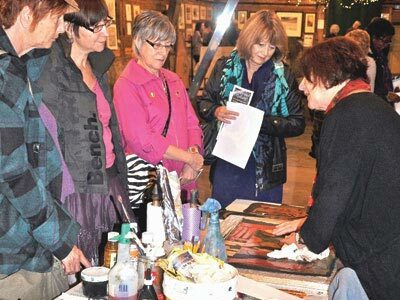 Artists Making an Exhibition of Themselves (or AMET) is a special evening of artists demonstrations, in association with the annual Artworks exhibition at Blackthorpe Barn. AMET is a special evening event when some of our Artworks artists set-up mini working studios in front of their work in the Artworks exhibition at Blackthorpe Barn, to demonstrate the media, materials & techniques used in their art, ready to answer any questions that visitors to the exhibition may have about their art. 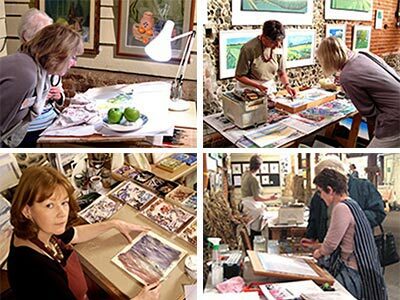 It’s like visiting ‘open studios’ but it’s all under one roof! The atmosphere is always bustling, creative & very inspiring – and refreshments are also available in the Artworks cafe. 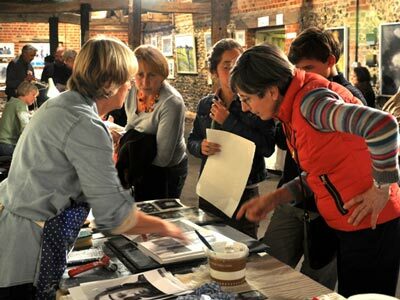 from 6pm to 9pm, at Blackthorpe Barn, Rougham, Suffolk – a special date in the Artworks diary! This special evening event is sponsored by The Curwen Press. The Artworks 12th annual art exhibition runs from 10 September – 2 October 2011, open 10am – 5pm daily at Blackthorpe Barn, Rougham, Bury St Edmunds, Suffolk IP30 9HZ (for SatNav). Click here to download a printable map to Blackthorpe Barn (PDF). Entry to the Artworks exhibition is free, there is ample parking with full disability access (two wheelchairs are also available if required). There will also be the Artworks Cafe selling light refreshments alongside the very popular Artworks Shop. If you haven’t yet visited, we hope you will enjoy your visit to Artworks. You can read more about Artworks history and view profiles of all our artists on the official Artworks website (see links to the right). This entry was posted in artworks news and tagged amet evening, artists, artworks, blackthorpe barn, demonstrations, suffolk on September 23, 2011 by admin.